"...will hold you spellbound for the entire 41 minutes, no doubt! Fantastic...you will be entranced...a truly magical experience! I give this my MOST HIGHLY RECOMMENDED rating." ...FASCINATING - AND NO LESS RIVETING THAN THE ORIGINAL. 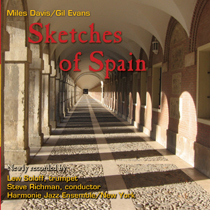 This is the only recording of Sketches since its Davis-Evans recording by Columbia in 1959 and 1960. You'll discover some new depth here and some distinctive, beautiful soloing, particularly from trumpeter Soloff. My favorites: their versions of Rodrigo's "Concierto de Aranjuez" and Evans's "Solea." Bravo. It seems impossible to believe that 50 years have flown by since Gil Evans and Miles Davis made jazz history with the original version. Fifty years, but what a perfect time to celebrate that triumph with A FRESH NEW VERSION. Soloff is wise not to try to duplicate the intimacy, but he certainly brings own brand of beauty to these works. The accompanying orchestra is the brainchild of its conductor, Steve Richman. They succeed from every vantage point in breathing new life into a stunning classic. Make sure you won't be interrupted by conversation -- or any other noise makers -- when putting this on your sound machine... IT'S...TOO GOOD TO MISS A NOTE.